KUALA LUMPUR (June 2): AirAsia group considers retraining its staff, as the advent of the fourth industrial revolution takes on the way businesses are run globally. Its co-founder Tan Sri Tony Fernandes said the revolution featuring technology-driven businesses, is expected to change the labour market dramatically with an anticipated reduction of employees, which the group is prepared for. “I think the fourth industrial revolution will change the scene dramatically. Provided airports support the change, there will be less workers and higher productivity, and I think we are gravitating towards retraining staff for work that are manually done, like check-in and boarding. “Who knows we might have robots as pilots one day. So we are training our staff for different functions and there is so much talent here, but (there must be) the ability to turn raw diamond into diamond. “There must be a culture of innovation in the company,” he said in a panel discussion titled: The Fourth Industrial Revolution and Sustainable Growth: What Next? The panel discussion organised by Ernst and Young Advisory Services Sdn Bhd on the sidelines of the World Economic Forum on ASEAN was also participated by Jobstreet Corp Bhd founder and chief executive officer (CEO) Mark Chang, largest China-based property platform Juwai.com co-founder Simon Henry, and strategic design firm Eight Inc founder and CEO Tim Kobe. Moderated by Ernst and Young global managing partner digital Richard Suhr, the event was opened by International Trade and Industries minister Datuk Seri Mustapa Mohamad, who called for a `scaling of the issue', especially in terms of policy implications. The revolution involves the coming of age of technology in the web, phones and lifestyle such as big data, analytics, artificial intelligence, machine learning and robotics. Meanwhile, Fernandes said AirAsia could not have existed without the internet, when it started at a time when purchasing flight tickets online was not the norm. “I believe in disruptive technology. My whole life has been about disruption. We just continue. Disruption does not just mean disrupt. We have to look at what is happening in the world and it must make sense to your company. 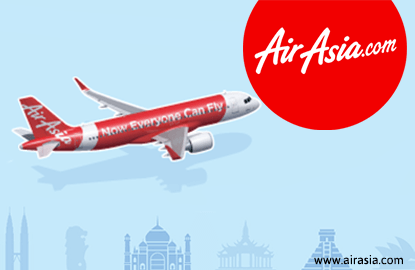 “AirAsia is a baby of the fourth industrial revolution (and) before AirAsia, no one bought flight tickets on the web. We believe in data, that is where we made some mistakes. “(As well as) understanding customers and providing value is going to be the next big thing,” he told theedgemarkets.com later. Earlier, he said that board of directors should make firm decisions on investing in innovation, instead of talking about return on investments. “Some companies do not know the value of technology. Too many boards are short-term … (too much focus) on return on investments which can be a misnomer sometimes, killing innovation,” he said. He added that companies would need to adapt quickly in the workforce, because productivity would change with the re-skilling and re-training of staff. On the government’s role in the segment, Fernandes maintained it should remain a facilitator and reduce regulations that hinder the growth of technology-driven businesses. “They regulate too much, there is top-down approach … and democracies are all over the place in the ASEAN region. Governments need to create an environment for innovation to allow freedom of thought and ideas,” he said. In the meantime, Chang, who pioneered the online-based job search tool, said looking back, he should have created a global product instead of a Malaysian one, as its growth was affected in countries like India and Vietnam. "I should have created a global product, because it would have only required a 10% customisation (when introduced in countries)," he said, while joking it was not an issue now, as he had sold the tool. In another instance, Suhr said the growth of urbanisation would spur more smart cities, in line with region’s economic growth. “There is massive population growth across Asia and that is leading to huge urbanisation, as the Southeast Asia region grows. We think the digital revolution would see a rise of smart cities. What drives this is that people want convenience and ease of use,” he said. He felt that the Malaysian government faces a dilemma in ensuring control and at the same time, enabling innovation. “I am not sure it is the role of the government to see which technology wins, but it is definitely its role to build a thriving economy and environment for people to build products. The challenge now is how to enable the businesses to grow,” he said.